The establishment and contribution of the laboratory of Hoi Shan Kwan from 1984 is described here. We have led, grown along and reflected the development of food science and safety, microbiology, fungal biology, omics, and bioinformatics in Hong Kong. I returned to Hong Kong in 1984 and started my independent research career in Biology Department of The Chinese University of Hong Kong (CUHK). It is the good tradition in CUHK that a young faculty member can be an independent principal investigator of his own laboratory and students. I was given total freedom to pursue what ever I wished to work on. I wished to carry out applied research in Chinese fermented foods but did not have a chance to do it. What I was interested in was curiosity-driven and basic: “Anaerobic respiration metabolism in Salmonella typhimurium”. S. typhimurium is a foodborne pathogen but my research was only indirectly related to food safety. We had a great time trying out all the advanced technology available in bacterial genetics and molecular biology. We established DNA sequencing using Sanger’s method first and later on established polymerase chain reaction (PCR) technology. We were the first laboratory to use PCR in Hong Kong. I could remember vividly that my first PhD student Dr. Kwong Kwok WONG used 3 small dry-block incubators filled with water to carry out thermos-cycling manually. He had to resist the constant interruption of my talking to him about his work during PCR reactions. He definitely missed out the cycling time frequently because of my interrupting him. We carried out global approach to obtain gene expression information with determination of promoter sequences simultaneously. These works were highly original and ahead of their time. Experience gained in these endeavors helped Dr. KK Wong to secure a Scientist position in the California Institute of Biological Research at La Jolla, California. He is now Professor in MD Anderson Cancer Center in Houston, Texas. I further studied anaerobic metabolism in Escherichia coli for one year, 1992-93, in Harvard Medical School, Boston, Massachusetts, We carried on with the studies of anaerobic metabolism of enteric bacteria until early 1990’s. In 1990, we thought the advances in molecular biology have reached a point that genetics of living organisms other than the model organisms can be analysed in greater details. Molecular markers could be generated with ease. We started to study the Shiitake mushroom Lentinula edodes with “modern” molecular methods. The first sets of molecular markers we generated were Sequence Tag Sites (STS) and the newly developed PCR-fingerprinting markers, namely Arbitrarily Primed PCR (AP-PCR) or Random Amplified Polymorphic DNA (RAPD). We were among the first laboratories to use these technologies in fungi. We obtained six Research Grants Council General Research Funds in a roll to study Shiitake mushroom. Gradually our study moved from genetic marker discovery to genetic map construction, gene expression profiling using RNA differential display or RNA-AP-PCR, Expressed Sequence Tags, and PCR-single sequence conformation polymorphism (PCR-SSCP). The number of genes sequenced and studied in each project increased from a few at a time to thousands at a time. During this time, we introduced several important molecular biological technologies such as high-throughput DNA sequencing, automated DNA sequencing, and DNA microarray to CUHK and Hong Kong. We also diversified our research interests to cloning of the first seafood allergen gene from shrimp, DNA authentication of food and Chinese medicinal materials. The shrimp allergen gene cloning was an extremely fruitful international collaboration between our team in Hong Kong led by Professor KH Chu and that in University of California, Davis, led by Professor Patrick SC Leung. We were the first group to clone and sequence a seafood allergen, in this case, the tropomycin protein gene. After the handover of Hong Kong in 1997, life went on as usual. We continued to pursue to understand mushroom biology with focuses on fruiting body development using transcriptomics, and gradually move up to genomics. Led by our Chairman Professor Norman YS Woo, we obtained funding to set up high throughput automated DNA sequencing facilities. We worked out the draft genome sequence of the Shiitake mushroom. However, working on Shiitake mushroom had been a rather lonely process. Few laboratories in the world was working on the genomics of this mushroom. Enlightened by colleagues of the Biology Department that answering basic scientific questions would be more fruiting if we work on a model. At that time, the model mushroom was Coprinopsis cinerea, the ink-cap mushroom. The complete genome of C. cinerea had been determined and there were several laboratories were collaborating to understand its biology in great depth. I asked the leader of C. cinerea studies, my friend Professor Patricia Pukkila, to join the international collaboration and was accepted. We published the complete genome sequence in 2010. Later on we were successful in securing a Community Science Program supported by Joint Genome Institute of Department of Energy, USA. This period also saw my fortunate involvement in the research and development project as a collaborator to Professor YC Kong to develop the modern herbal tea Trilex. We were lucky to have Dr. CF Chow as our major scientific associate. His extraordinary skills in Chinese medicinal material processing was instrumental in the development of Trilex. The R&D project was the first example in modernization of over-the-counter Chinese Medicine product manufacturing. In 2006, we were given an important task to help small and medium food manufacturers in Hong Kong to adapt to the new food nutrition labeling law. To accomplish that we were offered a substantial fund from the Jockey Club Charity Fund on the Chief Executive Community Project List, 2006. We spent almost five years, working night and day to achieve the goal. We were satisfied that many small and medium food manufacturers benefited from our help and sailed through the transition to adapt to the law. We offered our service as the “Food Composition Database”. Co-incidentally, the Centre for Food Safety of Hong Kong was formed in 2007 and I served as the first Chairman of the Expert Committee of Food Safety advising the Director of FEHD. After the terrible period of SARS epidemic in Hong Kong in 2003, Centre for Health Protection was formed to tackle infectious diseases. I have been serving on the Scientific Committee on Enteric Infections and Foodborne Diseases. I thought Genome sequences of foodborne bacterial pathogens would be the future of foodborne disease outbreak investigation. At the same time, I was asked to set up the first Next Generation DNA Sequencing System, the Roche 454 sequencer, in CUHK. 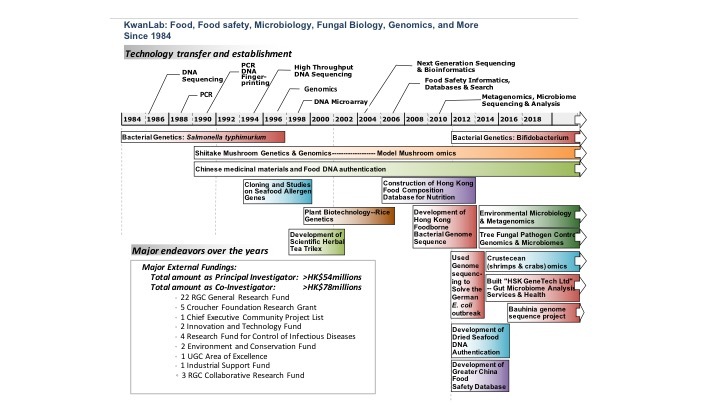 So I proposed a commissioned project for the Committee to build the first foodborne bacterial pathogen genome sequence database. Our experience in building this database allowed us to participate in the global crowdsourcing resolution of the German Escherichia coli epidemic in 2011. That was quite an experience. Along with our increasing experience in high-throughput DNA sequencing, we have been very active in bacterial, fungal, and crustacean genomics, transcriptomics, and metagenomics. One important application has been the tree fungal pathogen brown rot disease control. Our knowledge in bioinformatics acquired in these endeavors helped us to venture into building interesting databases and advanced search engines for food safety and dried seafood DNA sequences. Last, but not least, my colleagues, students and I formed a startup company applying our knowledge to offer services in gut microbiome analysis for health management. KwanLab has been very fortunate to participate in the scientific research and development in Hong Kong over the past 30 years. We have built our core competence in Food Science, Food Safety, Microbiology, Fungal Biology, Genomics and Bioinformatics, and applied them in many directions and applications. The culture of KwanLab has been collegiate, cooperative, open, courageous, and risk-taking. It has been a very satisfying journey and I look forward to serving the community for the years to come.